As a researcher, you are often urged to make your work openly accessible. And sure, that’s a laudable goal, but… What’s in it for you? With job prospects in academia being not that rosy, it is no surprise that open access is not the primary consideration for researchers considering where to get their work published. When push comes to shove, making a living is more important than access to your research. But why not both? You can give yourself that career boost and support open access. Here’s how. Open access proponents like to point out the purported citation advantage enjoyed by research that is made freely available. Unfortunately, though, journal name often still trumps the number of citations in terms of the career benefit it can bring you. 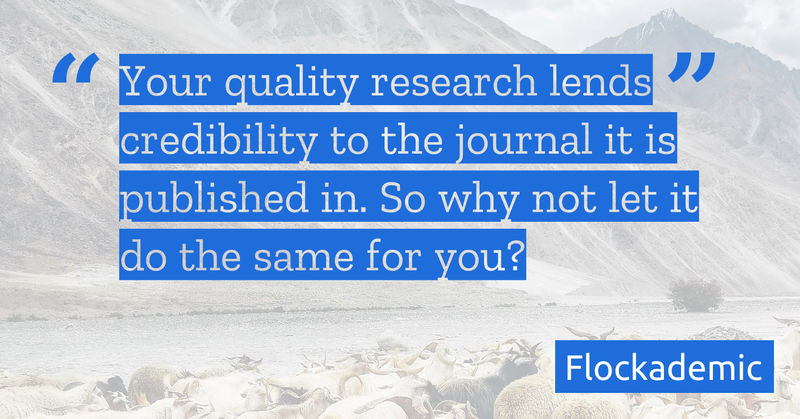 Publishing your research in a reputable journal lends credibility to your research. The reverse is true as well, however: your quality research lends credibility to the journal it is published in. So why not let it do the same for you? I am happy to announce that as of today, Flockademic helps you do exactly that. In addition to submitting your research to a journal, you can now publish your manuscripts to your personal academic profile on Flockademic. It’s really easy, too: sign in, and all research that is already linked to your ORCID will be there, waiting for you. All that remains for you to do is to share the relevant PDFs. By making all your research available in one place, readers interested in your work can easily follow what you’re up to —resulting in higher visibility of your research! And to top it off, you’ll also be contributing to a world in which publicly funded research is publicly available. So what are you waiting for? Start crafting your academic profile today. Increased discoverability: e.g. getting your work indexed by Google Scholar and Microsoft Academic Search. Audience building: e.g. allowing readers to receive email notifications when you publish new work. Rights checks: automatically informing you what versions of your work you can share. Sharing existing work: when your work is already freely available elsewhere, e.g. on arXiv, Flockademic can automatically make them available on your personal profile as well. Give your work that extra visibility boost; sign in to Flockademic now and start sharing your work!